The Social Selling Index (SSI) has been an important tool for sales professionals who want to go beyond social selling activities and measure how those individual efforts add up. We know that social selling is a vital component of success for many sales organizations: salespeople who excel at social selling are creating more opportunities and are 51% more likely to hit quota. It is because of this massive potential that measurement of social selling efforts is all the more important. 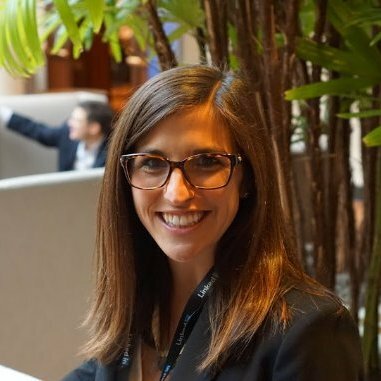 Empowering salespeople with the knowledge of where they stand with social selling can help them set clear goals and inspire them to become a better social seller. Today we’re excited to announce that SSI is available to anyone interested in understanding and improving their social selling efforts. What does the Social Selling Dashboard Tell You? By checking out your SSI, you'll see how you stack up against your industry peers and your network on LinkedIn. Further, you can see how you are performing on each of the four elements of social selling -- establishing your professional brand, finding the right people, engaging with insights, and building relationships -- and track your progress over time to help you understand how you're improving. Each color on the dashboard represents a different element of social selling, so you can see where you are strong and where you might need improvement. Seeing how your SSI performance on LinkedIn is changing over time can help you create a benchmark for your social selling activities, set goals for where you want to be, and track your progress. It will also let you see how your ranking changes compared to your peers, keeping you motivated in your social selling efforts. The Social Selling Index was developed by identifying a group of top performing sales professionals, analyzing their usage habits on LinkedIn, and determining how they use LinkedIn to drive successful outcomes. The formula behind the SSI is based on the social selling activities these professionals rely on, effectively connecting the dots between those efforts and their individual sales success. Today, many of our customers are using the SSI to measure their adoption of recommended social selling behavior on the LinkedIn platform. How Can You Improve Your SSI score? Establish your professional brand - Complete your profile with the customer in mind and become a thought leader by publishing meaningful posts. Find the right people - Identify better prospects in less time using efficient search and research tools. Engage with Insights - Discover and share conversation-worthy updates to create and grow relationships. Build relationships - Strengthen your network by connecting and establishing trust with decision makers. Whether you are trying to establish your professional brand, find the right people, engage with insights or build relationships with your prospects and customers, the LinkedIn Social Selling Index can help you succeed. 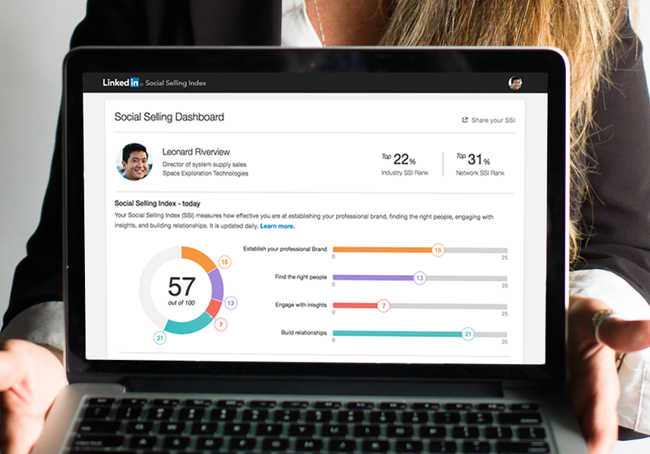 See how you stack up against the competition by checking out the Social Selling Dashboard and share your SSI with your network today. Currently available for English-speaking members only.